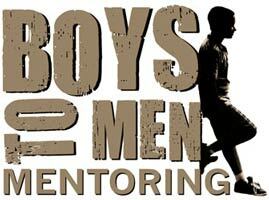 Boys to Men’s school mentoring program is a community based mentoring model serving middle school boys age 11-14, and high school boys age 15-17 identified by school administration to be at-risk of educational failure, dropping out of school, juvenile delinquency or gang-related offenses. By partnering with the schools, and working closely with school administrators, we are able to identify, and serve the boys most at risk for educational failure. 73% of the boys in the program do not have a father active in their life. Program elements include weekly in-school and after-school meetings of mentors and boys, a 48-hour Boy’s Adventure Weekend, a 24-hour experiential mentor training, and ongoing training and support for carefully selected and screened mentors. We offer three program models. After-school meetings: Boys voluntarily attend these weekly after-school groups. In-school meetings: Boys with academic and/or behavior issues are required by school administration to attend BTM group session during school hours. Boys to Men staff work closely with school administrators to provide additional support for these extremely at risk boys. 90% of the boys in these groups are fatherless. Evening groups: Open to all San Diego boys. The meetings follow a 32-week curriculum designed to help teenage boys cope with typical problems and issues at home and school, and bring awareness and intention to the important choices all boys face in their adolescent development. After 12 weeks of group meetings the boys and mentors are invited to attend the boys Adventure Weekend. This powerful weekend experience further deepens the trust, and connections between boys and their Mentors. Additional program elements include bi-monthly weekend activities, including community service projects, fishing trips, football games, campouts, and leadership development weekends.